A different view of our beaches Archive. We weaved down the mountain roads to the sea today, on a mission, four adults and one nine-year-old girl. I can barely type this because my hands are still so cold; almost as cold as my spirits. But I need to write this now, not later. We need to act now, not later. Our destination was the nearest beach, half an hour from the farm - the one that the artist Miro would run to from his masia at Mont-roig and which he immortalised with his brush. We go occasionally in the quieter, cooler seasons to wander and breathe, but this time, motivated by our daughter Ella to do what we can to stem a dreadful tide, our singular thought was to discover and gather what plastic and other waste littered the sand. 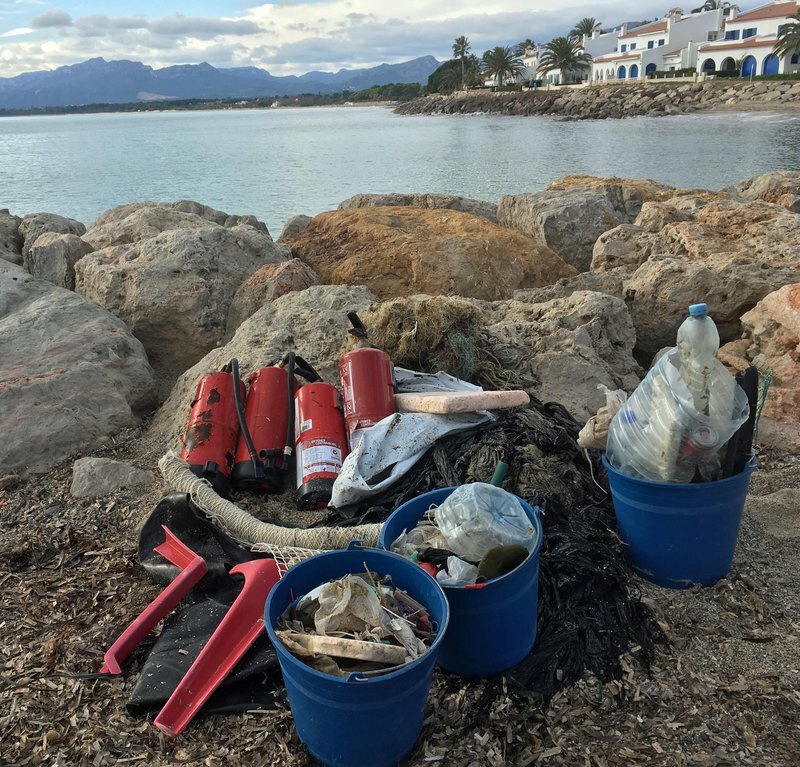 I was going to ask you to guess how much we removed in two hours, from just a 400-metre fragment of the precious Catalan coastline, but I can’t. You need to see it for yourselves. - FOUR fire extinguishers, one of which still contained blue mono ammonium phosphate ABC powder. - 20KG+ of black plastic in a knotted ball. It took two of us to lift it. At least the same amount again remains wedged in the rocks. - The inner tube of a tractor tyre. - A bundle of nylon fishing net and line. - A broken plastic chair. - Three buckets full of general plastic and metal debris, including straws, bottle tops, a sandal, fencing, food containers and broken scissors. All this and more from just 300 metres of Catalonia’s 580 km shoreline. And that was only the waste particles visible to the eye. I have been banging the table about how appalling the litter problem is, how blind we have become, and I won’t stop. We as a species need to wake up NOW. Our rivers, oceans and planet are in crisis because of us. And here, at home, in Catalonia, we as a people need to act independently, to show Iberia, Europe and the world, lead the world. We must take action now, both to clear the waste and also against anyone who is irresponsible. If you harm the environment you should be prosecuted and, more, be ashamed. But it should a positive movement, first and foremost, a celebration of what we cherish, and with an iron will to live sustainable lives, with a collective, social movement to improve our environment, our streets, towns, beaches and countryside, to cleanse them and cherish them. Our children will learn by a very different example. Let there be, at the very least, an annual CLEAN UP CATALONIA DAY, official or unofficial, with communities working together, sharing the load, reaping the goodness. Please look again at the photograph. Unbelievable? No. The truth. Think how you can make a difference. Join us in taking direct action. P.S. And if anyone dares to admit losing a pair of Real Madrid shorts, we have found them too.